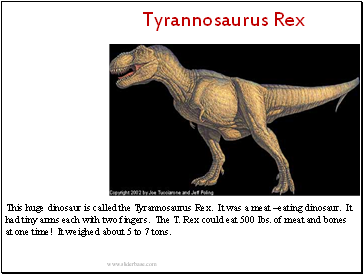 This huge dinosaur is called the Tyrannosaurus Rex. It was a meat –eating dinosaur. It had tiny arms each with two fingers. The T. Rex could eat 500 lbs. of meat and bones at one time! It weighed about 5 to 7 tons. 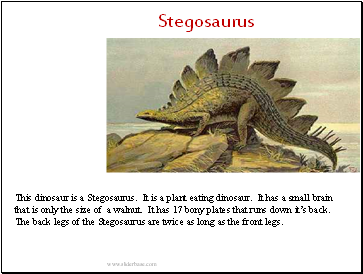 This dinosaur is a Stegosaurus. It is a plant eating dinosaur. It has a small brain that is only the size of a walnut. It has 17 bony plates that runs down it’s back. The back legs of the Stegosaurus are twice as long as the front legs. 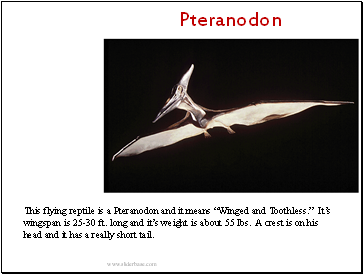 This flying reptile is a Pteranodon and it means “Winged and Toothless.” It’s wingspan is 25-30 ft. long and it’s weight is about 55 lbs. A crest is on his head and it has a really short tail. 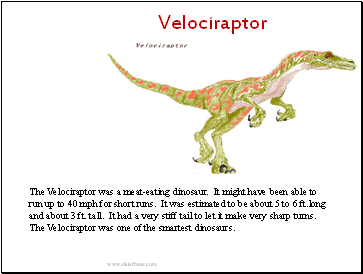 The Velociraptor was a meat-eating dinosaur. It might have been able to run up to 40 mph for short runs. It was estimated to be about 5 to 6 ft.long and about 3 ft. tall. It had a very stiff tail to let it make very sharp turns. The Velociraptor was one of the smartest dinosaurs. 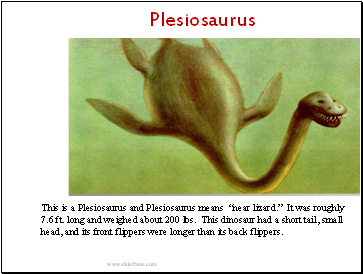 This is a Plesiosaurus and Plesiosaurus means “near lizard.” It was roughly 7.6 ft. long and weighed about 200 lbs. This dinosaur had a short tail, small head, and its front flippers were longer than its back flippers.